Western influence and the decaying state of the empire brought about the emergence of Pronoiarioi. “Pronoiai”, large estates bestowed by the emperor to his best horsemen with the obligation to field a barded warhorse ready to fight with themselves on it as well, equipped and ready for battle. Some of those were Latin or of Latin ancestry. “Pronoiai” or “Oikonomiai” could be regular lands but most of the time they are fresh conquered lands from the hands of the enemy, so their former “dynatoi” owners can’t claim them. Advances in western technology created lighter yet stronger chainmail, which allowed the Pronoiarioi to wear them from toe to the eyelids without the weight that accompanied earlier heavy horsemen like Kataphraktoi. In fact they must have wore 4 layers of armor, “esolorikon” padded gambeson and full body advanced mail “lorikion” hauberk. On top of that, an extra “lorikion” hauberk this time in big iron scales, which would serve to maximize protection against arrows, spears and lances. Over that the epilorikion quilted cloth would be used to blunt mace blows. Their armor is supplemented by arm and leg guard vambraces of splint construction, the “podopsella” for feet and “cheiropsella” for forearms. The helmet of Pronoiarioi is completely western. Not just westernized “Kassidion” as that of the Stratiotai, but a plain western helmet with a better construction and much larger brim that is called “Kassidion” as well. Kite shield, larger and stronger than that of the Stratiotai that covers a big part of their body, and thus limits the need for extra armor layers. Even their horse has less armor than that of the heavier Kataphraktoi. That means higher speed, and maneuverability at the cost of a slightly decreased protection. The paramerion sword they carry (one-edged, sligthly curved like a scimitar and worn at the waist) would be used when in melee with the enemy. They were primary lancers as their heavy knights counterparts were. This unit isn’t so much a Roman unit imitating a western one, it is more of heavy knight western unit but armed with roman weapons and armor. The big differences in armor, tactics and overall mentality that existed for hundreds of years between the Catholic knights of western Europe and Outremer regions, no longer apply. A cultural shift towards the west is in place, with many Western Catholic subjects of the Empire serving the empire as horsemen or infantry. Manuel himself is a big admirer of western style combat, even organizing joust matches. Pronoiarioi are as close to the heavy western knights as any Roman unit is going to get, while retaining a Roman identity. A lot of them are just Kavallarioi knights, whose bravery in battle enabled them to acquire a bigger “Pronoia” estate. 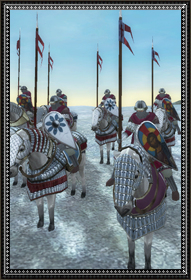 Historically “Pronoiai” were war-guifts to the best cavalrymen to both secure their loyalty and also make sure that they would be fighting alongside the emperor in the finest outfit they possibly could. Smaller “Pronoiai” provided Kavallarioi, bigger and richer ones, “Pronoiarioi”. Some of those pronoiai not only gave a “Pronoiar/Pronoiarios” to the throne but as many as up to 70 infantrymen. Bound to the Emperor with sacred oaths, they would fight to the last man in his name. However hard hitting lancers they are however, they still operate as a part of a larger army. They should be reigned in at all times, as they can’t win the battle alone, and a clever enemy will annihilate them on a wall of spears and pikes and heavy horsemen of its own in their backs. They should be preserved until an opportunity for a breakthrough arises in which case they should assault with all their might.